ShadowNurse has 3 years experience . This topic may have been brought up before, but I'm simply curious to see if other AN members are part of the LGBT community and how that has impacted your nursing career (if at all). As a transgender nurse I can say it does help me the couple of times I have cared for transgender patients, and sometimes I can educate my colleagues. Yes, I am a lesbian, married to my wife for 5 years now. There are a handful of us on this site although there's not much discussion along these lines. In my experience, there is certainly a greater visibility in terms of gay and lesbian representation in nursing for many years now and it has been largely positively received. Transgender nurses, however, are probably not as visible yet overall but I've worked with quite a few transgender nurses and has not heard of negative experiences from them. That could just be the fact that I work right in San Francisco where it wouldn't be viewed as unusual. I’m proudly bisexual, married to a man, and work inpatient pediatrics...it has definitely been a struggle at times. Don't have an answer but I want to thank you for being out, open, and willing to help cis folk with our questions. I started my post-college working life as an HIV counselor in the 90s. People who were gay, lesbian, bi, and trans taught me much, and the lessons I learned impact my nursing practice to this day. Over the years I've worked with many LGBTQ nurses and CNAs. We never treated them differently. I think nursing is the one profession where it's not judged harshly because we also have LGBTQ patients. I may be wrong because I'm not a member of the LGBTQ community but from what I've witnessed, you all are just viewed as another coworker/friend. The one exception may be bigoted patients or their family members. However, it's not exclusive to LGBTQ, I've seen that occur with Black, Hispanic, Muslim, man/woman, etc. Also not a member of the LGBTQ community, but I've worked with a number of nurses who are. I'll second the "just viewed as another friend and coworker" answer. Bigoted patients and visitors notwithstanding, most of your colleagues won't really care about your sexuality or gender as long as you're friendly, dependable and a low maintenance co-worker. As a long-time night-shifter, I've had this discussion with some of my gay and lesbian colleagues, and the only people who felt their career had been impacted by their sexuality were a Filipino couple who left Manila to come to the US because they weren't as accepted there. I have always worked in large, urban teaching hospitals, so that may have skewed my data. City folk seem to be more accepting in general. I'm heterosexual, but I'm also an ally. My son, a new grad RN, is gay and married to a fantastic guy for almost six years. He has experienced little discrimination on the job, although sometimes the patients can be obnoxious, and one of the residents at his current job (residential care facility) refuses to let Ben touch him. Thankfully my son has a thick skin and doesn't take it personally. It's so funny, Ben and his husband aren't into Pride or "the lifestyle". They're two relatively conservative men who are just trying to make a life like any other couple. They are completely monogamous. They work hard, they make do, they fight over money, they kiss and make up. I live with them so I see them working at their marriage, which isn't always easy because I have to zip my lip so I don't give them unsolicited advice! While I am not part of the LGBT community myself I my now former daughter-in-law is transgender and I was there for her during her transition. While their marriage didn't survive her transition she is still family to me. On a work related note I do work with several members of the community and I can say with confidence that every one happens to be a well liked co-worker and even if they were a jerk and not very well liked they would still be treated with respect. When I was still working NOCS just due to our schedules being similar I was frequently the only straight person working and we had one bigoted asshat of a resident that was very vocal in his dislike of any person not white or straight as well as quite needy and demanding. After awhile of constantly interrupting my work and leaving my unit to deal with his frequent wants I had enough and refused to cater to him anymore. I told him he could deal with the staff that was assigned to him or do without. That slowed his frequent "fluff my pillow" type requests considerably. Overall though given how much societal norms have changed in my elderly resident's lifetimes I must say I am a little surprised at how rarely this has been an issue. That resident is really the only one that was ever difficult with staff. I'm looking to get into nursing school, I had previously been in nursing school about 10 years ago, and about two years ago I recognized that I am transgender (female to male). I'm nervous about a lot of things in going back to nursing, being transgender a small worry, but it's good to see so many have such positive experiences either being in the LGBT community and working as nurses or being allies. I’ve never personally experienced being treated any differently d/t sexual orientation or being a member of the LGBTQ+ community in nursing. 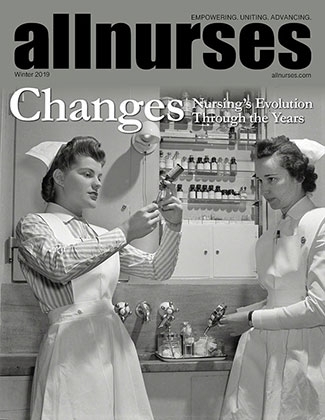 I have experienced degradation because I was a male nurse many times when I first started, however (“You’re a male, pick it up...”, “Get the male to lift them...”, “Get the male nurse to do the compressions...”, “We will just leave it for the male nurse to do because he’s faster...”, etc). I think the bigger picture is how you treat the patient. That being said I remember a colleague who identified as gay would go into a particular patients room (LTC) and you’d hear the patient screaming for him to not come in to his room ever again. The patient would call and request me instead but apparently never realized we were of the same community. Haha! Yeah i’ve been checking out posts in the male nurse forum and feel like I’m potentially in a weird spot in those situations, I want to be seen as male by anyone, but I’m also not nearly as strong as a cisgender man, so they will be sorely disappointed telling me as “the male” to do something like that. I’ve not experienced any trouble in my current job which is not at all nursing related and not had any troubles with the families I’ve worked with as a behavioral therapist, at least the ones i’ve kept in contact with since coming out.